Please join these demonstrations and/or host or attend an event in your vicinity around July 6, to stand in solidarity with Lac-Mégantic and other towns and cities demanding an immediate ban on the railroad industry’s extreme energy pipeline-on-wheels. Thanks to everyone who has provided invaluable, relevant ideas, connections, and on-the-ground support for these events. We welcome your questions, suggestions, assistance, and refreshments at these upcoming actions: Please reply through the enclosed contact channels or on-site. Expect ongoing descriptions of Northwest train and terminal issue background and recent updates, via WIRT facebook and website pages. For the fifth workshop of annual, training sessions on regional coal, oil, and tar sands train spotting, David Perk of 350Seattle in Washington will present methods for track-side observing, documenting, monitoring, and reporting Northwest fossil fuel train traffic, via photos, videos, and social media. He will discuss rail routes from the plains to the coast, train descriptors (date, time, location, direction of travel, locomotive colors, numbers, and orientation, and tanker and buffer car types, marks, and hazmat codes), refinery and receiving facilities, regular rail system operations, stopovers, and transit times, and train watch motivations and resources. Please join this appreciated, Skyped conversation with David, sharing images, handouts, skills, and insights, at the East Bonner County Library, 1407 Cedar Street in Sandpoint, Idaho, at 5:30 pm on Thursday, July 5. To remember and honor the 47 Lac-Mégantic disaster victims and all lives impacted by oil-by-rail traffic and accidents, please gather for a vigil at 12 pm on Friday, July 6, at the South Division Avenue and U.S. Highway 2 intersection, outside the Sandpoint office of the Idaho Department of Lands (IDL). 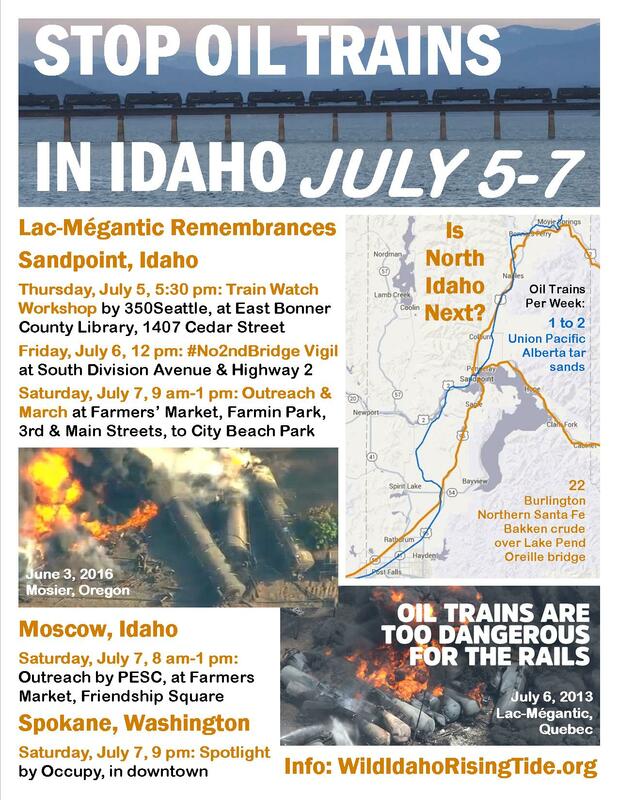 Bring your friends, family, neighbors, co-workers, protest signs, and creative spirit, to show community resistance to oil trains and a second rail bridge over Idaho’s largest and deepest lake. On Thursday, June 21, the IDL director in Boise issued a final order approving Burlington Northern Santa Fe (BNSF) Railway’s encroachment permit application for its proposed, Sandpoint Junction Connector project [5, 6]. Still requiring Clean Water Act water quality certification from the Idaho Department of Environmental Quality, dredge and fill approval from the U.S. Army Corps of Engineers, and bridge permits from the lead, federal agency, the U.S. Coast Guard, BNSF plans to construct two temporary, work spans, three permanent, parallel, rail bridges, and two miles of doubled tracks west of the current rail line across Lake Pend Oreille, Sand Creek, Bridge Street, and downtown Sandpoint. Within a day after BNSF secured Idaho agency permission to further risk lives and pollute regional lake and aquifer water with expanded, rail infrastructure and transportation, the company derailed and dumped Alberta tar sands into a Missouri River tributary near Doon (doom? ), in northwest Iowa . Along and over the Kootenai, Clark Fork, Pend Oreille, Spokane, Columbia, and other rivers throughout north Idaho and the Northwest, BNSF carries 22 volatile, Bakken crude oil trains every week, while Union Pacific hauls one to two trains of equally explosive and irretrievably sinkable tar sands per week. Over 90 percent of these shipments must cross the almost mile-long, Lake Pend Oreille bridge. The Palouse Environmental Sustainability Coalition (PESC) will converge at its Moscow Farmers Market outreach table on Friendship Square, Fourth and Main streets in Moscow, Idaho, between 8 am and 1 pm on Saturday, July 7, to commemorate the Lac-Mégantic oil train disaster and support regional opposition to BNSF’s second Lake Pend Oreille rail bridge. Along with WIRT, PESC will circulate a #No2ndBridge petition and offer updates on coal and oil trains traversing Idaho. At similar, past events, PESC members have shared their written thoughts about the Lac-Mégantic accident, which occurred on the night before their march in the 2013 Tar Sands Healing Walk in Alberta. Gather with volunteer activists and fellow citizens between 9 am and 1 pm on Saturday, July 7, at the WIRT outreach table under the Farmin Park clock, at the Farmers’ Market at Sandpoint, Third and Main streets. 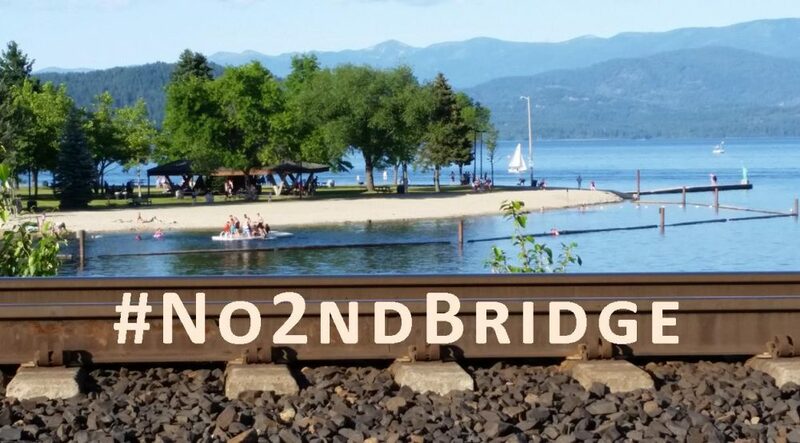 We hope to talk with residents and visitors of the one-mile-wide, north Idaho “bomb train blast zone,” and provide petitions, educational flyers, and brochures about Northwest oil trains and infrastructure, like the second, BNSF, rail bridge proposed for nearby Lake Pend Oreille [8, 9]. Starting from the Farmin Park clock at 1 pm on Saturday afternoon, July 7, we will walk with signs protesting the Northwest pipeline-on-wheels and railroad expansion, through downtown Sandpoint and over the Sand Creek bridge, to the historic train station and City Beach Park. At these public destinations, we will share reflections and stories about the isolated vulnerability of rural, rail corridor people and places to oil train catastrophes. As the sun sets, Occupy comrades will generously offer a brief, light projection display of social and climate justice messages on tall buildings in downtown Spokane, Washington. Meet after 9 pm wherever you see this light show, for discussions among curious passersby, about Northwest oil train and terminal issues.